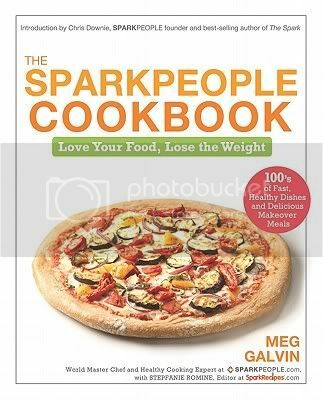 The Sparkpeople Cookbook is not, however, what one would commonly consider to be a diet cookbook. Instead, the focus is on cooking for a healthy eating lifestyle, making smart choices as far as ingredients and portion sizes. The book even includes the basics of a number of healthy cooking techniques, including roasting, grilling, sweating, steaming, and more. This is followed by a number of appendices, including a sample weekly meal plans, choosing a cooking oil, and keeping fruits and vegetables fresh. The only real oddity is the inclusion of Lemon Chicken with Spinach Pasta under the Meatless Mains section. It seems to just have been misplaced in the incorrect section, but it is an unfortunate error, because it looks like an incredible recipe, and I would hate for people looking specifically chicken dishes to miss it. Despite the one strange placement, the layout of the individual recipes is quite good. There are facts about the food used, suggestions to make the dish into a meal, and possible additions. The recipes all look amazing, and are straightforward without being overly simplistic. I made the Herbed Bulgur and Lentil Salad and it was delicious, I will definitely be making it again. I can’t wait to keep making things, like the Broccoli and Spaghetti Squash with Lemon Pepper, the Slow-Cooker Salsa Chicken, and the Lemon Chicken with Spinach Pasta.